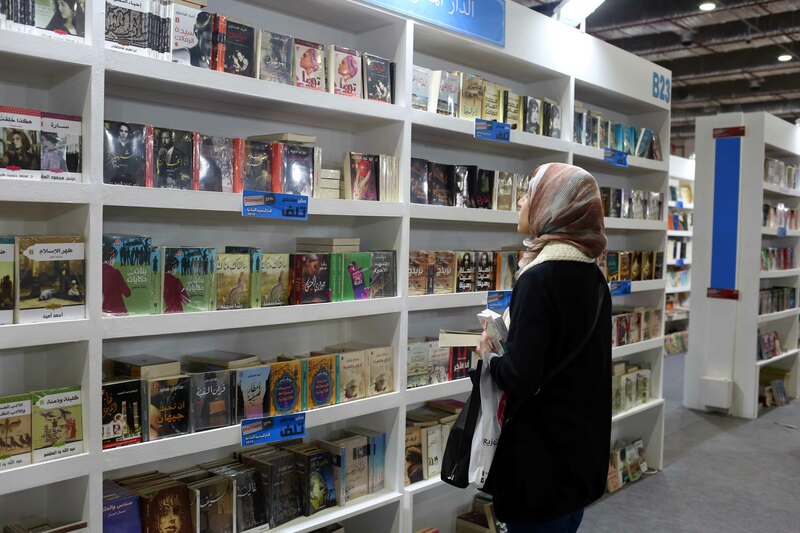 50th Cairo International Book Fair: New and improved? Last Saturday, I headed to the public bus stop in Abdel Moneim Riyad Square to catch a shuttle bus to the 50th edition of the Cairo International Book Fair at its new home in Fifth Settlement. The bus was filled with passengers, including two secondary school students laughing about how far the new location was. “We’re almost in the Dubai desert!” one joked. I checked the distance on my phone, and it turned out we’d traversed almost 20 kilometers from the bus stop to the fairground. 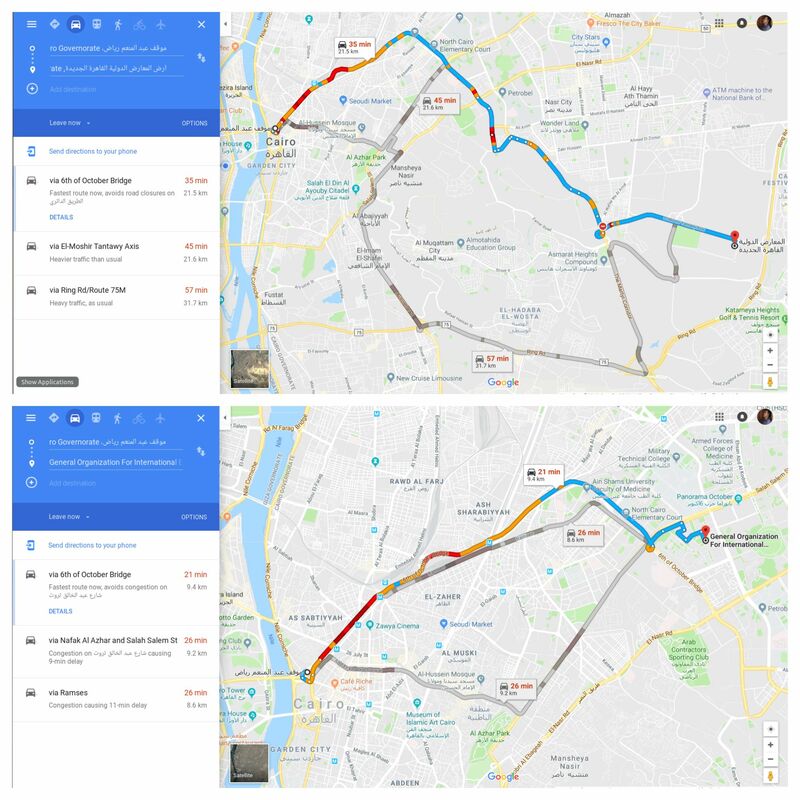 The distance from Abdel Moneim Riyad to the book fair’s previous location, the Nasr City Exhibition Ground, was a mere nine kilometers. I was curious to see what would change after the fair was moved to a new location, outside Cairo’s main urban center. The first edition of the book fair took place in 1969 at the Gezira International Exhibition Ground in Zamalek, where the Cairo Opera House stands today. For its sixteenth edition, in 1984, the book fair was relocated to the Nasr City fairground, which spans 700,000 square meters, to accommodate the growing number of publishers and visitors. 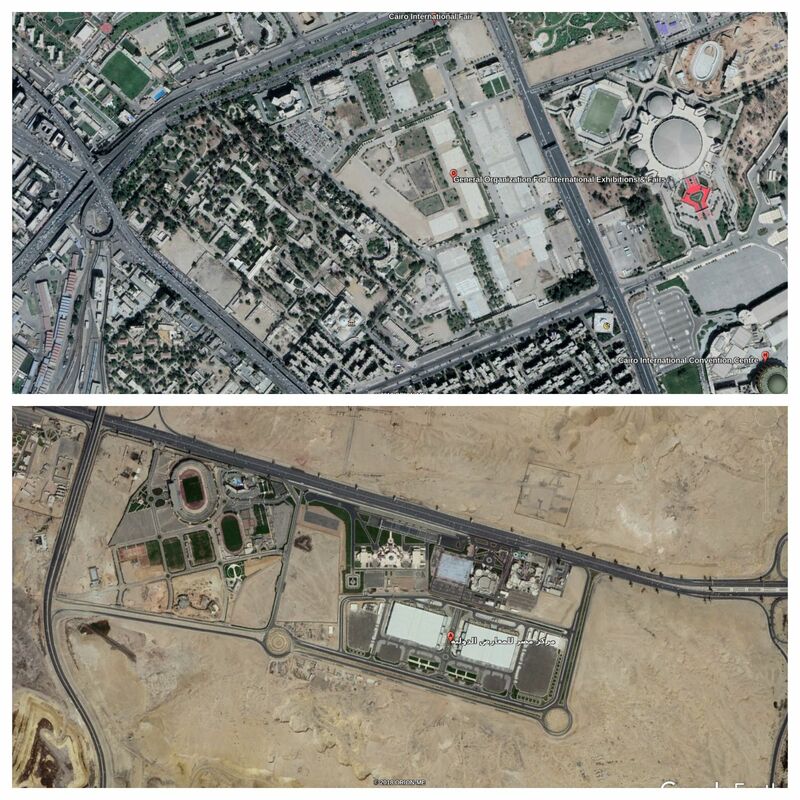 The Egypt International Exhibitions Center, where the fair is now held, is 311,000 square meters. As soon as we arrived, we could see the long lines of visitors waiting in front of the ticket windows and gates. The president of the General Authority for Books, Haitham al-Hag Ali, announced several days ago that the fair had drawn nearly one million visitors by the end of its fifth day. Last year, the authority put the number of fairgoers at 1,750,00 in the first five days. Although this year’s number is much lower, it exceeds pre-fair predictions, as organizers feared attendance would decline significantly as a result of the move to the Fifth Settlement — fears that were not unfounded, as overall attendance declined by nearly 2 million visitors this year in comparison to the last. Visitors parked in the exhibition center’s two parking lots and an adjacent outdoor parking lot, and along the main road. At Gate 5, where visitors entered after buying their tickets, the line moved gradually, as each visitor passed through a metal detector with their bags. I, however, dodged the wait by heading to Gate 3, where journalists were allowed to enter with their passes. As soon as you enter the exhibition center, you feel as though everything is set in place: there is a covered area with chairs and tables for visitors to rest, with a small play area for kids in one corner, complete with swings and slides. One of the two wide streets is lined with restaurants and cafes. The fair’s online map is available for download on its Facebook page to make it easier to find booths of interest. There are also many volunteers throughout the center to guide you. The fair is made up of four exhibition halls, each neatly divided into three sectors: A, B and C, where each publishing house displays under a certain number. In each of the four exhibition halls, visitors are met with a list of the publishing houses and their booth locations. It is clear that the booths are better organized than they were in the previous space. Here, the shelves are uniformly structured and the space is precisely allotted to each publishing house. What the new exhibition center lacks in space (in comparison with Nasr City’s fairground, at least), it makes up for in efficient planning, allowing housing a total of 1,273 publishers from 35 countries. Most comments about this year’s edition, be they from exhibiting publishers or visitors, praise the fair’s organization. Youssef heads to the fair every day at 9 am, and stays until it closes its doors at 8 pm. Before, when the book fair used to be held at Nasr City, she used to visit her house’s booth only two to three times throughout the entire duration of the fair. “I couldn’t deal with the dust and the hassle,” she explains. Prior to 2010, when I used to visit the fair, the books were always displayed in exhibition halls. Afterwards, however, a decision was made to demolish all the buildings — except for the one belonging to the General Authority for Investment and the Fund for Social Development — in preparation to build new and improved ones. When that happened, the General Authority for Books would build tents every year and rent them to publishers, according to Mohamed al-Baali, founder and director of Sefsafa publishing house. Sometimes, publishers would rent the space and build the tents themselves. He said that, although the tents were a nuisance, they allowed publishers to modify their booths, adding more tables or shelves for display. Some publishers would design their booths from scratch, he says, which is no longer possible in light of the uniform design in the new Fifth Settlement space. Moreover, the modern structure of the exhibition halls, along with their elaborate design, have caused a considerable hike in booth rents. Yehia Fekry, the director of Al-Maraya for Cultural Production, said it has become more expensive to rent a space to organize a book signing or a talk by an author. He, too, expects sales to be the same as last year, which he says could be enough to break even, but not to generate profit. “If you want to profit in light of these new prices, you need to sell tons and tons of books,” he said. Baali describes previous editions of the fair in Nasr City as more of a book “carnival,” or a moulid, which, according to him, is not necessarily a bad thing. “This is how Egyptians celebrate,” he says. Last year, Mada Masr reported on the book fair as “communal space,” where visitors go not merely to buy books, but also to hang out in the abundant green spaces in the Nasr City fairground. We spoke to families sitting on the grass with tea, and young people reading books they bought in the shade of a tree. Most of them spoke of the fair as a space to spend a good time outdoors, enjoying the winter sun. Yet many complained of poor-quality services and facilities: the dirty bathrooms, litter-strewn gardens and lack of benches where visitors could sit. The fair’s new location is a less flexible space. There isn’t much greenery for picnics and such — the only space available to lounge is the covered area with tables and chairs, which is smaller than the public spaces at the old grounds. Inside the exhibition halls, meanwhile, there is almost no space to rest, save for a few rare seats in the aisles between display booths. When crossing from Hall 1 to Hall 2, I searched in vain for a place to sit without having to go outside the building, which had plenty of space for more seats against the walls. Instead, visitors made themselves comfortable on the floor. Even when I went outside, I found nowhere to sit. Many visitors sat on sidewalks to eat, drink or rest. In a nutshell, it is much more difficult to treat the book fair as a “hangout” now: organizers have managed to bring it closer to a mere bookstore. The fair’s relocation to the Fifth Settlement had not been the only option. Last year, Al-Masry Al-Youm published a report about the Nasr City Exhibition Ground, stating that in 2009, iconic Iraqi-British architect Zaha Hadid won a design competition to revamp the space; as a result, the old buildings were demolished two years later. Talk of rehabilitating the exhibition ground resurfaced in 2014, when the General Authority for Exhibitions announced a plan to develop it by building a massive 600-room hotel, in order to make better use of the vast land. It wasn’t until 2017 that the Fifth Settlement plan was brought up. Meanwhile, a new “exhibition city” is currently being built in the new administrative capital, which lies almost 60 km away from central Cairo. It is unclear whether the book fair will eventually be relocated there, or if it will be used solely for corporate exhibitions. Baali says that, during its 34-year run at the Nasr City Exhibition Ground, the book fair passed through two stages: the first was before the inauguration of the third metro line to the east of Cairo, with a stop at the exhibition ground, and the second was after the metro opened for use. Before the metro stop, visitors mostly relied on the public buses assigned for the fair, and other forms of transport that could take them to Salah Salem Street, such as taxis or microbuses. In the second phase, the metro line substantially raised the number of annual visitors to the fair, as Baali demonstrates: the fair had three million visitors in 2016, four million in 2017, and, in 2018, it nearly reached five million. For the current edition, the Public Transport Authority designated six passenger lines operated by 100 buses, from major squares around Cairo to the fair’s new location in the Fifth Settlement to make it easier for visitors to reach the space. However, the number of visitor did not exceed 3 million, according to the head of the General Authority for Books. Fekry, meanwhile, thinks the remote location is a major problem, and poses a different view of how relocating further to the east — from central Cairo to Nasr City (an upper middle class neighborhood at the end of the 20th century) then to the Fifth Settlement (a stronghold for the upper middle class and more affluent classes since the beginning of the 21st century) – is affecting who visits the fair. To him, moving eastward does not merely mean moving further and further away from the center of the city; rather, it has class manifestations that can be reflected in the way the structure of the book fair itself has changed. Perhaps Fekry exaggerates, perhaps he does not. Perhaps Youssef is overly optimistic; perhaps she is right. In any case, one edition is not enough to judge the scope of the change caused by this move to the Fifth Settlement. And, after all, this might not be the fair’s final home — perhaps we will find ourselves heading further east next year, this time to the new capital, with a whole new dynamic. 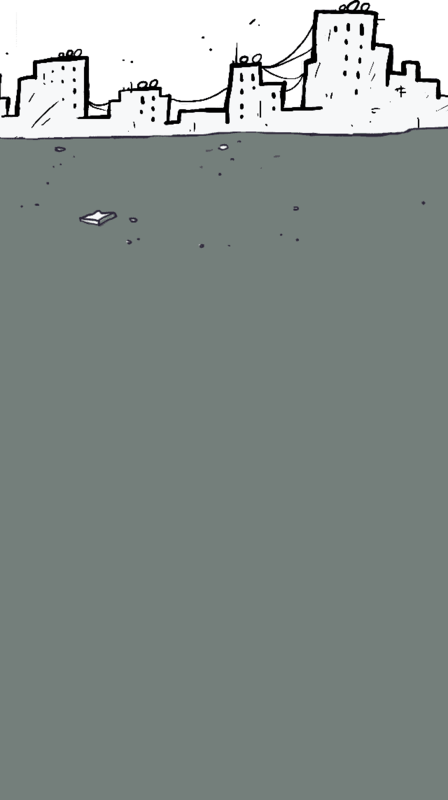 Video: How can we fit the world into folders?